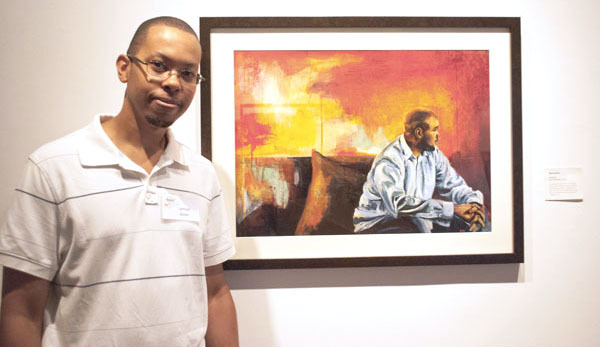 In 2013, after seeing a screen printing demo at a local art store, Jamaal started experimenting with printmaking and made it his primary focus. His fine art has been displayed at the Art on 5 Art Gallery, Mano A Mano Art Show. It has also been included in the Atlanta Print Biennial Show and at various art shows around the Metro Atlanta area. Additionally, Jamaal has done graphic design work for Iota Phi Theta Fraternity, Inc. and Spoken Magazine. In 2004, Jamaal moved to Atlanta, GA where he now resides with his wife and two children. He is represented by Montanette Jones of Atlanta, GA.
My art reflects my experience growing up in a small southern town and its culture. A small town life tends to look back on people and events with a sense of nostalgia and reverence. I create layered images with photos collaged into the background the same way old buildings are the background for everyday life in the South. The collage is a reminder of things past and also serves as the foundation for everything that proceeds it. Using screen printing and painting, I add the images and information that are symbols of the present moving through that environment. Text provides more context and helps the messages resonate.